Some of the National Hockey League’s players of color are feeling a draft. At least 17 minority players are among the players left unprotected by the NHL’s 30 teams for Wednesday’s Expansion Draft to help form the inaugural roster for the Vegas Golden Knights. The players of color made available – a nicer phrase than “unprotected” – include a likely future Hockey Hall of Fame inductee, three multiple Stanley Cup winners, three Olympians, and a few minor league prospects. Emerson Etem, left wing. The 29th overall pick in the 2010 NHL Draft, Etem has bounced from the Ducks to the New York Rangers to the Vancouver Canucks and back to the Ducks. And he’s boomeranged between Anaheim and its American Hockey League affiliate in San Diego. He only appeared in three games for the Ducks in 2016-17 and was held scoreless. He does have 22 goals and 24 assists in 173 NHL regular season games and 6 goals and 2 assists in 23 playoff games. Malcolm Subban, a Boston Bruins’ 2012 first-round pick. Could he be Vegas-bound? Malcolm Subban, goaltender. Subban was 24th player picked in the 2012 NHL Draft but has been unable to secure a spot on a Bruins roster that features Tuuka Rask between the pipes. Rask won the Vezina Trophy in 2013-14 as the NHL’s best goaltender. The younger brother of Nashville Predators defenseman P.K. Subban, Malcolm Subban appeared in 32 games last season for the Providence Bruins, Boston’s AHL farm team. His stats: 11 wins, 14 losses, a 2.41 goals-against average and a .917 save percentage. He had 2 losses in the AHL playoffs and sported a 2.12 goals-against average and a .937 save percentage. Johnny Oduya, defense. Oduya was a member of the 2013 and 2015 Chicago Stanley Cup teams and the Swedish team that won the Silver Medal at the 2014 Winter Olympics. He had 2 goals and 7 assists in 52 regular season games for the Blackhawks last season. He has 37 goals and 145 assists in 798 career regular season contests and 6 goals and 22 assists in 106 career playoff games. Jordin Tootoo, right wing. The diminutive dynamo of Inuit heritage was limited to 2 goals and 1 assist in 50 regular season games in 2016-17. He has 65 goals and 96 assists in 723 games with Chicago, Detroit, Nashville, and the New Jersey Devils. Forward Gemel Smith, the Dallas Stars’ 2012 fourth-round pick..
Gemel Smith, center. The Stars took the 23-year-old in the fourth round with the 104th overall pick of the 2012 NHL Draft. He hasn’t seen much time in Big D. He scored 3 goals and 3 assists in 17 regular season games for Dallas in 2016-17. His younger brother, forward Giavani Smith, was taken by the Detroit Red Wings in the second round with the 46th overall pick in the 2016 NHL Draft. Jujhar Khaira, center. Khaira was one of the feel-good stories of the 2016-17 season when he scored his first NHL goal – a source of pride for North America’s South Asian community. The Oilers took Khaira in the third round with the 63rd overall pick of the 2012 NHL Draft. His one goal and 2 assists were his only points in 10 games for the Oilers in 2016-17. Jarome Iginla, right wing. Iginla, 39, is one of hockey’s most-decorated players. He’s a two-time Olympic Gold Medal winner, and a recipient of the Maurice “Rocket” Richard Trophy as the NHL’s leading goal scorer in 2002 and 2004 and the Art Ross Trophy as the league’s leading scorer in 2002. He won the Lester B. Pearson Award – the most valuable player award voted by the players – in 2002. Iginla, a sure-fire Hall of Famer when he retires, had 14 goals and 13 assists in 80 games for the Kings in 2016-17. Jordan Nolan, center. A proud member of the Ojibwe Nation, Nolan played for the Kings’ Stanley Cup championship teams in 2012 and 2014. Nolan, the son of former Buffalo Sabres Head Coach Ted Nolan, appeared in only 46 games for the Kings last season and tallied 4 goals and 4 assists. Matt Dumba, defense. Of Filipino heritage, Dumba posted a career-best 11 goals and 23 assists in 76 games. His plus/minus – an indicator of defensive responsibility – improved from plus-1 in 2015-16 to plus-15 in 2016-17. Al Montoya, goaltender. The well-traveled Cuban-American goaltender could be on the move again. A 2004 first-round of the Rangers, Montoya has strapped on the pads for the New York Islanders, Florida Panthers, Phoenix Coyotes, and Winnipeg Jets before he seemingly settled in as Carey Price’s backup in Montreal. Montoya appeared in 19 games for the Habs, posted an 8-6-4 record with a 2.67 goals-against average and a .912 save percentage. Devante Smith-Pelly, right wing. Devo is coming off a down season in New Jersey, his third team since the Ducks chose him with in the second round with the 42nd overall pick in the 2010 draft. He scored only 4 goals and 5 assists in 50 games. Christopher Gibson, goaltender. The black Finn didn’t play a minute in Brooklyn in 2016-17 and had a short season with the Bridgeport Sound Tigers, the Isles’ AHL team. There, he appeared in seven games and won 6. He had a 2.52 goals-against average and .912 save percentage. Gibson played in four NHL games in 2015-16, posted a 1-1-1 record with a 3.40 goals-against average and an .882 save percentage. Pierre-Edourard Bellemare, left wing. The French player probably enjoyed his most memorable season in 2016-17. It started with the World Cup of Hockey, where the fourth-line Flyers player became a key contributor for Team Europe and ended with him playing before his countrymen at the 2017 International Ice Hockey Federation World Championship in Paris. In between, Bellemare had a solid enough year for the Flyers that the team re-signed him to a two-year deal at $1.45 million per year and made him an assistant captain. The 32-year-old checking line forward scored 4 goals and 4 assists in 82 regular season games. He has 17 goals and 17 assists in 237 career NHL games. Trevor Daley, defense. Daley is experiencing the cruel business side of hockey. Win a Stanley Cup one week, get exposed to the expansion draft the next. The 33-year-old offensively-talented and defensively-responsible player began his NHL career with the Dallas Stars in 2003-04. Daley reached the 20-point mark seven times during his tenure with Dallas. He had 5 goals and 15 assists in 56 games for the Penguins in 2016-17 and tallied 1 goal and 4 assists in 21 playoff games that ended with him winning a second Stanley Cup. Daley 78 goals and 200 assists in 894 career NHL regular season games. Joel Ward, right wing. Injuries in 2016-17 hampered the 36-year-old wing who earned a reputation as a clutch playoff performer during his NHL career. He scored 10 goals and 19 assists in 78 regular season games and 1 goal and 3 assists in six playoff games. He’s tallied 22 goals and 30 assists in 83 playoff games for San Jose, Nashville, and the Washington Capitals. J.T. Brown, right wing. A tough player who isn’t afraid to speak his mind on social issues, Brown had 3 goals and 3 assists for the Lightning last season. He has 18 goals and 39 assists in 262 NHL regular season games. T.J. Oshie, right wing. Why in the world would the Capitals expose a player who notched 33 goals and 23 assists in 68 games last season? Our friends at the Russian Machine Never Breaks Capitals fan site break it down to money and uncertainty. Oshie needs a new contract and the NHL currently isn’t sure what the league salary cap will be next season. And Oshie could become an unrestricted free agent on July 1. All that might be enough for the Golden Knights to pass on him, leaving the Caps to move forward with a new deal once the 2017-18 salary cap is set. We’ve picked the 2016-17 Color of Hockey All-Star team, but who would be on the greatest team of players of color of all time? My choices span eras – from a time when goalies stood up and sticks were actually made of all wood – to today’s fast-paced, high-tech game. You’ll recognize some of the players chosen for the team while others named may not be familiar to new hockey fans. Let’s be clear, this isn’t affirmative action on ice. These current and former players have distinguished themselves at hockey’s highest levels – their Stanley Cup rings, NHL awards, Olympic medals or Hockey Hall of Fame inductions prove that. So who would you choose for your all-time team? Share your picks via the Color of Hockey Facebook page or Twitter @ColorOfHockey. Grant Fuhr, goaltender. Owner of five Stanley Cup rings, a seven-time National Hockey League All-Star, the first black player inducted into the Hockey Hall of Fame in 2003, and one of the NHL’s 100 Greatest Players, Fuhr is a no-brainer to be the All-Time team’s starting netminder. Fuhr won all five Cups with the Edmonton Oilers in the 1980s and early 1990s. But he also played for the Toronto Maple Leafs, Buffalo Sabres, St. Louis Blues, Calgary Flames, and Los Angeles Kings in an NHL career that spanned from 1981-82 to 1999-00. A 1988 Vezina Trophy winner as the league’s best goaltender, Fuhr is only one of six NHL goalies with over 400 wins. His stats: 403 wins, 295 losses, 114 ties and a 3.38 goals-against average in 867 NHL games. Not bad for a player who many thought was washed up after a season with the Kings in 1994-95. His career was resurrected by a trade to the Blues and hooking up with fitness guru Bob Kersee, husband and trainer of Olympic Gold Medal sprinter Jackie Joyner-Kersee. Fuhr gave a special shout-out in his Hall of Fame induction speech to another person who influenced his life and career – Willie O’Ree, the NHL’s first black player. Jarome Iginla become the NHL’s second black captain as a member of the Calgary Flames. Jarome Iginla, right wing. Iggy will be the second black NHL player in the Hall of Fame after he retires. He should be a first-ballot inductee just for the length of his full name: Jarome Arthur-Leigh Adekunle Tij Junior Elvis Iginla. 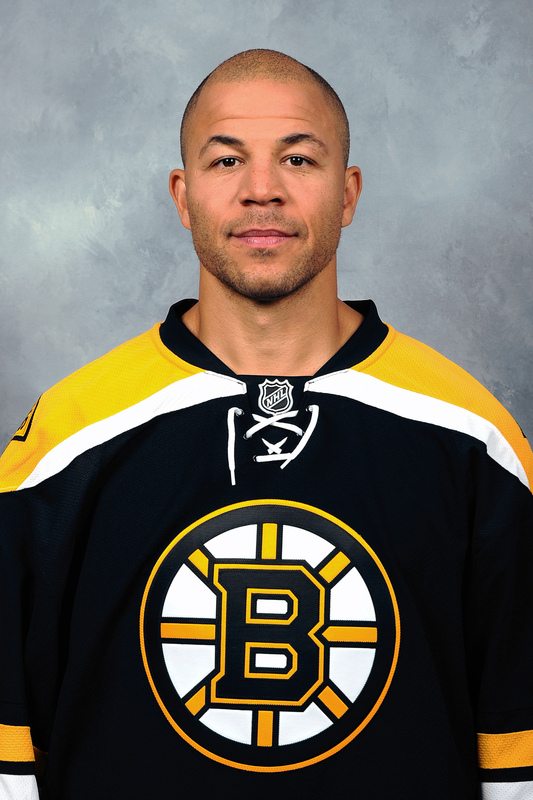 Iginla, whose father is Nigerian, is one of Canada’s most-decorated and loved players. He scored two goals that helped power Canada to a 5-2 win over the U.S. at the 2002 Winter Olympics in Salt Lake City that gave the True North its first Olympic hockey Gold Medal in 50 years. He scored 5 goals at the 2010 Winter Games in Vancouver, but he’s best known for his assist on Pittsburgh Penguins center Sidney Crosby’s overtime goal that clinched another Gold Medal for Canada over the U.S.
Iginla has 625 goals, 675 assists in 1,554 NHL games, most of them with the Flames from 1996-97 to 2012-13. He has 37 goals and 31 assists in 81 playoff games. He won the Maurice “Rocket” Richard Trophy as the NHL’s leading goal scorer in 2002 and 2004 and the Art Ross Trophy as the league’s leading scorer in 2002. He won the Lester B. Pearson Award – the most valuable player award voted by the players – in 2002. But it’s the big trophy, the Stanley Cup, that Iginla covets most to cap his career. That Cup quest has taken him to the Pittsburgh Penguins, Boston Bruins, Colorado Avalanche and Los Angeles Kings. An aside: With all his accomplishments, why was Iginla left off the NHL’s 100 Greatest Players list? Just asking. Bryan Trottier, center. A seven-time Stanley Cup winner – four straight with the New York Islanders, two with the Penguins and one as an assistant coach for the Avalanche – an eight-time NHL All-Star, and winner of both the Hart Trophy as the league’s MVP and the Art Ross Trophy as its top scorer in 1979. Of Metis, Chippewa, and Cree heritage, Trottier was the glue of the Islanders’ Cup dynasty. He won the Calder Cup as the NHL’s best rookie in 1975-76, a season in which he scored 32 goals and 63 assists. He played 1,279 NHL regular season games between 1975-76 to 1993-94 and tallied 524 goals and 901 assists. He notched 71 goals and 113 assists in 221 playoff games for the Islanders and Penguins. He also performed a rare feat by representing the United States and Canada in international competition. Trottier entered the Hockey Hall of Fame in 1997 and is on the NHL’s 100 Greatest Players list. Paul Kariya, left wing. One of the mightiest of the then-named Mighty Ducks of Anaheim when it came to goal scoring. The 5-foot-10, 180-pound wing played 15 seasons NHL with Anaheim, Colorado, St. Louis and the Nashville Predators. He scored 402 goals and 587 assists in 989 regular season games and 16 goals, 23 assists in 46 playoff contests. He led the University of Maine Black Bears to the 1993 NCAA Division I championship and won the Hobey Baker Award that year as U.S. college hockey’s best player. The Mighty Ducks chose him with the fourth overall pick in the 1993 NHL Draft. Kariya was named to the NHL’s All-Rookie team in 1995 and was an NHL All-Star in 1995-96, 1996-97, 1998-99, 1999-00 and 2002-03. Kariya, whose Japanese-Canadian father was born in an internment camp during World War II, played on Canada’s 1994 Silver Medal-winning Winter Olympics squad and on the 2002 Olympic team. Jim Neilson, defense. Nicknamed “Chief,” Neilson played at the dawn of the era of rushing defensemen like Bobby Orr and Brad Park. Part Cree, part Dane, Neilson was a 6-foot-2, 205-pound defenseman who was agile enough to occasionally play left wing. N.Y. Rangers defenseman Jim Neilson zeroes in on Montreal Canadiens goaltender Loren “Gump” Worsley (Photo/Courtesy Hockey Hall of Fame). But D was where Neilson’s heart and mindset were and he helped solidify the Rangers’ blue line from 1962-63 to 1973-74. He finished his career playing for the old California Golden Seals, Cleveland Barons and the WHA’s Edmonton Oilers. Neilson scored 69 goals and 299 assists in 1,023 NHL games and 2 goals and 16 assists in 65 post-season contests. His numbers aren’t as eye-popping as offensive-minded Hall of Famers Orr, Park, Paul Coffey, and Ray Bourque. But his talent level can’t be disputed. He was an NHL All-Star in 1966-67, 1969-70, and 1970-71. P.K. Subban, defense. Subban is currently in his playing prime, yet he’s already accomplished enough to earn a spot on this list. He won the James Norris Trophy as the NHL’s best defenceman in 2013. He was a member of the Canadian team that won the Gold Medal at the 2014 Winter Olympics in Sochi – although he only played 11 minutes during the entire tournament. He helped Canada capture gold at the International Ice Hockey Federation World Junior Championship tournaments in 2008 and 2009. He has 73 goals and 245 assists in in 500 NHL regular season games and 13 goals and 36 assists in 74 career playoff games. Most of his career points came as a member of the Canadiens, the team that selected him in the second round with the 43rd overall pick of the 2007 NHL Draft. Subban anticipated being a Canadien for life, establishing roots in Montreal and pledging $10 million to Montreal Children’s Hospital – the largest philanthropic commitment by any athlete in Canadian history. But Subban was sent to the Predators in June 2016 in a controversial trade for defenseman Shea Weber. Ray Emery, goaltender. A netminder known for dropping the gloves as well as using them to make dramatic saves, Emery’s career is a tale of two goalies. He was the brash youngster who led the Ottawa Senators to the Stanley Cup Final in 2006-07. Goaltender Ray Emery played for four NHL teams in his career. After suffering a career-threatening hip injury, he morphed into a steady, mature veteran who served as a backup goalie on the 2013 Stanley Cup champion Blackhawks. But even as an aging vet, Sugar Ray enjoyed fisticuffs. Still, Emery, a 2001 Ottawa fourth-round draft pick, was one of the best puck-stoppers in the business. He compiled a 145-86-28 win/loss/overtime loss record in 287 regular season games from 2002-03 to 2014-15. He appeared in 39 playoff games for Ottawa, Philadelphia and Anaheim and had a 21-17 record. Tony McKegney, left wing. McKegney was the NHL’s first high-scoring black player, the first to score more than 20 goals in a season. He scored 20 or more goals for five straight seasons from 1979-80 to 1983-84. His best season: 40 goals and 38 assists in 80 games for the Blues in 1987-88. McKegney tallied 320 goals and 319 assists in 912 games from 1978-79 to 1990-91 for Buffalo, St. Louis, Detroit Red Wings and Chicago Blackhawks. McKegney’s route to the NHL was rooted in racism. He initially signed a contract with the Birmingham Bulls of the defunct World Hockey Association, but the team’s owner had second thoughts after fans in Alabama complained about the prospect of having a black player on the team’s roster. So McKegney, the 32nd player chosen in the 1978 NHL Draft, joined Buffalo instead. Tony McKegney was a high-scoring forward for Buffalo, St. Louis, Detroit, Quebec, N.Y. Rangers. and Minnesota North Stars (Photo/Buffalo Sabres Archives). Angela James, center. The first woman of color inducted to the Hockey Hall of Fame in 2010, James was a trailblazer regarded as the Wayne Gretzky of women’s hockey. She was a dominant player in the Ontario Women’s Hockey Association in the late 1970s and a fixture on Canada’s international women’s teams. She led Canada to a Gold Medal at the first International Ice Hockey Federation Women’s World Championship in 1990, scoring 11 goals in five games. She powered Canada to gold medals in 1992 in Finland, 1994 in Lake Placid, and 1997 in Kitchener, Ontario. James was also a force for Canada on gold medal teams in 1996 and 1999 at the Three Nations Cup tournament. Despite those impressive credentials, Canada left James off its roster for the 1998 Winter Olympics in Nagano, Japan- the first Winter Games that women’s hockey was featured. Canada’s Angela James is one of two black players in the Hockey Hall of Fame (Photo/Courtesy Hockey Hall of Fame). The snub didn’t stop the accolades from rolling in. James was inducted into the Black Hockey and Sports Hall of Fame and the Ontario Colleges Athletic Association Hall of Fame in 2006. She was inducted into the International Ice Hockey Federation Hall of Fame in 2008 along with fellow Canadian Geraldine Heaney and the United States’ Cammi Granato. James entered Canada’s Sports Hall of Fame in 2009. The Canadian Women’s Hockey League introduced the Angela James Bowl, a trophy awarded to the league’s leading scorer, in 2008. An indoor ice rink in Toronto’s Flemingdon Park was renamed the Angela James Arena in 2009, making it one of the few skating facilities in North America named after a black person. Forward Reggie Leach, Number 27, scored 19 goals in 16 playoff games in 1975-76. Reggie Leach, right wing. Nicknamed the “Riverton Rifle” for his Manitoba hometown and his lethal shot, Leach scored 381 goals and 285 assists in 934 NHL regular season games with the Flyers, Bruins, Red Wings, and California Golden Seals from 1970-71 to 1982-83. He was a prime-time Stanley Cup Playoffs performer with 47 goals and 22 assists in 94 career post-season games. He scored 19 playoff goals in 1976 – 5 of them in one game against the Bruins. Leach is the only non-goaltender to win the Conn Smythe Trophy as the NHL’s most valuable playoff performer while skating for a losing team. The Canadiens defeated the Flyers for the Stanley Cup in 1976. The proud member of the Ojibwe Nation is the only member of the Philadelphia Flyers’ famed LCB Line – Leach, center Bobby Clarke, and left wing Bill Barber – who isn’t in the Hockey Hall of Fame, which many hockey aficionados regard as an injustice. 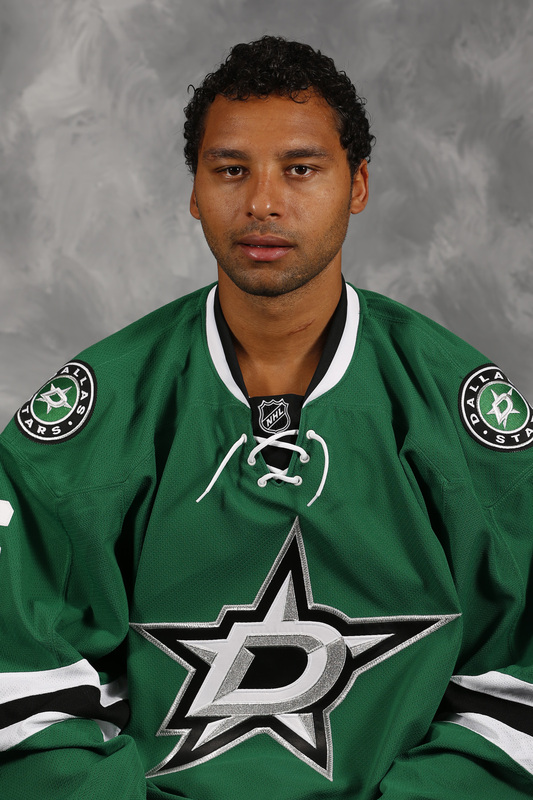 Trevor Daley, defense. A smooth-skating, offensively-talented and defensively-responsible player who began his NHL career with the Dallas Stars in 2003-04. Daley reached the 20-point mark seven times during his tenure with Dallas. He has 78 goals and 200 assists in 894 regular season games. He has 6 goals and 11 assists in 69 playoff games – and counting. An ice-time eater, Daley averaged 21 minutes per game for Dallas between 2008 and 2015. Still, the Stars traded Daley to the Blackhawks for forward Patrick Sharp. After 29 games the Hawks dealt Daley to the Penguins in December 2015. There, Daley became a cog in Pittsburgh’s drive to the Stanley Cup last year, though an ankle injury prevented him from playing in the Final against the San Jose Sharks. That didn’t stop Daley from being the first Penguins player to be handed the Cup from team captain Sidney Crosby for a skate after winning it. The gesture fulfilled a wish from Daley’s ailing mother to see her son hoist the Stanley Cup. A week later, Trudy Daley passed away from cancer at age 51. Alec Martinez, defense. A two-time Stanley Cup winner, Martinez has been a steady puck-moving defenseman since his first full season the Kings in 2009-10. Los Angeles selected Martinez from Ohio’s Miami University in the fourth round of the 2007 NHL Draft. Since then, Martinez has tallied 48 goals and 99 assists in 419 NHL regular season contests. He has 6 goals and 10 assists in 60 career playoff games. In 2014, Martinez became the first NHL defenseman to score clinching goals in two playoff series in the same season. One goal was the Game 5 overtime winner against the Rangers that clinched the Stanley Cup for the Kings. The beauty of Montreal Canadiens defenseman P.K. Subban isn’t just his chocolaty brown skin, but the thickness of it. It allows him to not only play in the intense hockey fishbowl that is Montreal but to thrive in the environment. It lets him deflect criticism in some media and National Hockey League circles that he’s nothing more than a flashy, mouthy, high risk-high, high reward defenseman who can’t be trusted with a game on the line. It allowed the indignity of being the reigning Norris Trophy winner – the prize awarded the NHL’s best defenseman – but only playing 11 minutes for Team Canada Head Coach Mike Babcock during the entire 2014 Winter Olympics roll off his back and not prevent him from enjoying his experience in Sochi, Russia. It allowed him to ignore the torrent of boos from Boston Bruins fans at TD Bank Garden Thursday night to score two goals, including the double overtime blast from the blue line that gave the Canadiens a 4-3 victory in the first game of their second-round their Stanley Cup Playoffs series against Boston. The thickness of Subban’s hide is probably also allowing him to tune out what’s hopefully a sub-section of hockey fans who, infused with keyboard courage and maybe a beer or five, took to their electronic devices after Thursday’s game and let loose some racist emails and tweets aimed at Subban. The N-word, porch monkey, and other outdated racial epithets flashed onto social media no sooner did Subban’s goal hit the back of the Boston net. The ugly episode had the same modus operandi as when Washington Capitals forward Joel Ward scored a playoff series-ending goal against the Bruins in 2012. That deluge of hate prompted Bruins management and National Hockey League Commissioner Gary Bettman to issue statements condemning those so-called fans. Friday, the Bruins oranization once again found itself admonishing the less-enlightened element of the team’s fan base. “The racist, classless views expressed by an ignorant group of individuals following Thursday’s game via digital media are in no way a reflection of anyone associated with the Bruins organization,” team President Cam Neely said in a statement issued by the team. Political leaders in Boston, a city that has had its struggles with race in the past, also voiced disdain about the racial hate directed at Subban. Other tweets and emails raised interesting questions. What do these alleged Bruins fans say or do when black Boston forward Jarome Iginla scores a goal? What will they do if and when top Bruins goaltending prospect Malcolm Subban, P.K.’s younger brother who recently completed his rookie season with the American Hockey League’s Providence Bruins, plays for the big club? When Willie O’Ree made history in 1958 as the NHL’s first black player, he did it wearing a Boston Bruins jersey. Ironically, O’Ree did it playing against the Canadiens in Montreal. Hockey has come a long way since then. But the racist messages hurled at Subban shows how much farther the game has to go.